A search for American Southern Home Health Insurance Company reveals that the company does not have “Health” in its name. 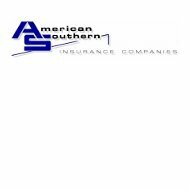 American Southern Home Insurance Company is now a member of the Munich-American Holding Corporation and a subsidiary of American Modern Insurance Group. As its name indicates, American Southern sells home insurance–not health insurance. Still looking for health insurance? Do not worry! Simply type in your zip code and you will find health insurance rates that fit your needs. In addition to American Southern Home Insurance, the American Modern Insurance Group includes seven other insurance companies, serving policyholders across the United States. While American Southern Home Insurance Company does not provide health insurance, its parent company American Modern Insurance Group is licensed in all 50 states to provide property and casualty insurance. American Modern’s specialty home insurance includes coverage for manufactured homes, rental homes, seasonal homes, and even vacant homes. They also have insurance policies for non-residential properties and multiple rental properties, as well as tailored specialty homeowners’ insurance and residential fire coverage. These policies are more detailed and offer more coverage than simply adding a rider to your existing homeowner or automobile policies. American Modern Insurance Group prides itself on the way it handles its customers’ claims. One page of their website is fully devoted to their Claim Center, including a video, statistics, and a link to their online instructions for filing a claim. The company says that its claims adjusters all participate in hands-on repair training, so that they fully understand what and how long it takes to make the type of repairs that for which its customers make claims. Because of this, the company says that its claims are processed quickly, with 80% of property claims settled in 30 days or less. Nearly three-quarters of their customers who file a claim hear back from an adjuster that same day. Customers can contact American Modern Insurance all day, any day, in order to make a claim. Policyholders can call 800-375-2075 any time of the day, send a fax to 513-947-4040, mail to the address listed above, or fill out an online form to file a claim. There are different links to different forms online, depending on the type of claim a customers is filing. American Modern Insurance Group explains the claims process on its website and promises quality service from all of its adjusters, whether they work from the corporate office or are contracted with from somewhere else in the United States. The credit rating organization A.M. Best gave American Southern Home Insurance Company and American Modern Insurance Group an “A+” superior rating for financial strength and an “aa-” for long-term issuer credit ratings. A.M. Best has designated the insurance company’s financial outlook stable. Unlike a lot of other health insurance companies, or other insurance companies, American Modern Insurance Group offers up customer testimony on its website, with quotes from its policyholders. Of course, there are only positive remarks about the company, but the Better Business Bureau also rates the company and all of its subsidiaries with a very strong “A+”. Factors behind the positive rating include the way the company handled any complaints, the complaint volume for a company of its size, and the many years that the company has been in business. American Modern Insurance Group offers an online job listing, searchable by location and job type. Open jobs range from analysts and accountants to adjusters and sales managers. Applicants may apply directly for a particular position or submit their resume for general consideration. If you are applying for a job with American Modern Insurance Group, you should ask what benefits are available, as they are not listed on the website. However, its Ohio headquarters does appear to be a fun place to work at, with free gourmet coffee, a well-equipped fitness room with exercise classes, an outside fitness trail, situated on 55 wooded acres near to Cincinnati, a modern city. Do not forget! Put your zip code in to find the health insurance rates for your area.